Our product range includes a wide range of pet jar 9000 ml and plastic jar with tap. Our product range includes a wide range of plastic jar with tap, pet jar, pet spice jar and pet jar 9000 ml. 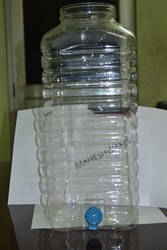 With the strong assistance of our knowledgeable professionals, we are able to offer Plastic Jar with Tap. Our plastic jar is manufactured using finest quality material under the expert guidance of experts, with vast experience in this domain. Our plastic jar is checked by quality controllers so as to dispatch fault free range. In addition to this, this plastic jar is available from us in numerous sizes & customized options as per customer’s requirements.